According to the U.S. Centers for Disease Control and Prevention (CDC), the leading causes of death in the United States today include many of the usual suspects. Topping the list are things such as heart disease, cancer, chronic lower respiratory illness, accidents, stroke, Alzheimer’s disease, diabetes, influenza and pneumonia, kidney disease, and suicide.1 But consider the fact that, in many cases, there’s often just one cause behind these conditions that people, for the most part, seem to overlook: chronic stress. Causes of stress can be anything from that nasty habit of daily “road rage,” stress at work from working too much with little or no rest, or constantly worrying about what the future holds. Longstanding stress in whatever way it manifests itself can be deeply harmful to the body – not only physically, but also emotionally and even spiritually. How Is Your Body Coping With Stress and Anxiety? While the human body is fully equipped to combat the negative effects of acute stress, persistent (ongoing) stress and anxiety is an entirely different animal. This type of longstanding stress takes a much bigger toll on the body than many people think. It wreaks some of its worst havoc on the glandular and endocrine systems of the thyroid and adrenals that are responsible for producing the various hormones that our bodies need to live and thrive. What was designed to be a temporary “fight or flight” response to occasional stressors by these important systems is forced into becoming a permanent coping mechanism for constant, unrelenting stress. If left unchecked, this type of chronic stress will eventually deplete the body’s hormone stores to dangerous lows. This sets the stage for a cascade of even worse health problems that are likely to form in their absence. We’re talking potentially life-threatening metabolic changes like blood sugar imbalances (type-2 diabetes), brain damage, decreased bone density and muscle wasting, increased blood pressure, impaired immunity and healing, excess fat growth (especially around the abdomen), and elevated risk of heart attack. What Are the Signs of Chronic Stress? Go Here To Learn More Today! It is generally recognized that things like prayer and meditation, exercise, leisure, and rest are great ways to relieve stress: and these are all good things, indeed! But what about diet and herbal support? We don’t hear much about that, and yet there’s an entire class of herbs known as adaptogens that are uniquely suited to support the body’s efforts to combat prolonged stress. As their name implies, adaptogens help the body to adapt to difficult situations in life that contribute to chronic stress, in effect stopping it before it begins to take its toll. What makes adaptogens even more special is the fact that they don’t change any specific function of the body. Rather they aid the body’s adaptive structures to better respond to outside influences and stressors that, if persistent enough, can throw it majorly off-kilter. In essence, adaptogens normalize the physiological state of the body to help release it from the constant state of “fight or flight” that demarcates what it means to be chronically stressed. One of the ways that adaptogens accomplish this mighty feat is by targeting the hormone most associated with the damaging effects of chronic stress: cortisol. Cortisol is often referred to as the “aging” hormone, though not necessarily because it causes our bodies to age. Cortisol is actually quite helpful when it isn’t being produced excessively in response to stress. Like all of the other hormones that our bodies produce, cortisol is essential for life. But it’s only supposed to be produced in small amounts, and for a limited time, as a buffering agent to keep the many systems of the body running smoothly. When stress gets out of control, so does cortisol. It turns into a deadly killer that saps energy instead of creating it, and that impairs immunity rather than supports it. This is where adaptogens come into play. Adaptogens intercede in place of cortisol to give the adrenal glands a break, effectively guarding them against becoming fatigued. Cortisol levels decrease when adaptogens are present because adaptogens function similarly to cortisol. And because they’re introduced exogenously (from outside the body), adaptogens don’t cause any strain whatsoever on the body as excess cortisol does. The body needs all of these hormones to keep its many systems functioning well and in-sync with one another. This then allows cortisol, which functions as a type of master hormone, to spend more of its time guarding the body as it’s supposed to – rather than harming it in response to chronic stress. It’s no wonder that the traditional systems of medicine both in India and China have been using adaptogenic herbs for thousands of years. These herbs help ward off stress and promote energy, calm, and balance throughout the body. The tonifying properties of adaptogens (“tonifying” means increasing the available energy of a body part or system) truly are special in that these precious substances help to uplift the body while simultaneously leveling it out. Much like how a thermostat keeps the temperature inside your home not too warm, and not too cool, but just right. Ashwagandha. Arguably the most highly prized of the adaptogenic herbs, ashwagandha (Withania somnifera), also known as Indian ginseng, has a multi-millennia track record of powerful tonic effects in the realm of supporting immunity and emotional balance. Eastern medicine has long recognized the incredible ability of ashwagandha to support balanced cortisol levels while helping to mitigating stress. Astragalus. A popular herb in Traditional Chinese Medicine (TCM), astragalus (Astragalus propinquus) is similarly suited to support the immune system while buffering the effects of stress. Astragalus is also said to help the body in repairing stress-related damage from the past, while at the same time redirecting cortisol away from vulnerable stress receptors. Cordyceps. A nutrient-dense mushroom from the endoparasitoid family, the cordyceps (Ophiocordyceps sinensis) fungi isn’t technically an adaptogen in a traditional sense. But it does possess powerful adaptogenic properties as they pertain to immunomodulation and stress relief, which makes it a worthwhile option. Eleuthero. Also known as Siberian ginseng (Eleutherococcus senticosus), eleuthero has many of the same properties as ashwagandha and astragalus, with the added bonus of helping to support increased energy levels and optimal sexual function. Holy basil. Sometimes referred to as Tulsi, holy basil (Ocimum tenuiflorum) is particularly suited to help the body better respond to both physical and emotional stress. Its tonifying effects specifically on the mind are what set it apart from some of the other adaptogens, and many regards it as being powerfully anti-aging as well. Licorice root. Known scientifically as Glycyrrhiza glabra, licorice root is another energizing adaptogen with immune-boosting properties and a special ability to help protect the thymus gland from being damaged by cortisol. It’s important to use this one under the guidance of a qualified healthcare practitioner, though, because it can affect blood pressure levels. Maca. Also known as Peruvian ginseng (though it doesn’t actually hail from the ginseng family), maca (Lepidium meyenii) is regarded as being one of the “lost crops of the Andes.” It has long been prized by the native people of Peru as an herbal tonic of the highest order. Its many reported benefits include increased strength, stamina, energy, libido, and sexual function. Panax Ginseng. Sometimes referred to as Asian, Chinese, or Korean ginseng, Panax ginseng is the most well-studied of the ginseng varieties and is considered to be the “truest” form of ginseng. Panax ginseng is said to provide non-specific support against mental, physical, and environmental stressors. Rhodiola rosea. 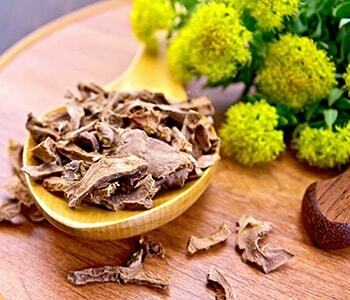 Both calming and invigorating, Rhodiola rosea is another powerful adaptogenic herb that combats stress as well as fatigue – hence its immense popularity throughout Siberia where it’s natively grown. Schisandra. This incredible berry has been a staple of traditional medicine for centuries, as it’s known to help protect against adrenal fatigue while supporting healthy inflammation levels. A robust fighter against free radicals, schisandra actually seeks out stress hormones in the blood and helps neutralize them. At the same time, it supports enhanced physical performance, endurance, and energy levels. The American Psychological Association (APA) warns that chronic stress is directly linked to at least six (and likely more) of the most common causes of death in modern America. Longstanding stress wreaks some of its worst havoc on the glandular and endocrine systems of the thyroid and adrenals. There are many ways that stress shows up in the body – both physically and emotionally. There is an entire class of herbs known as adaptogens that are uniquely suited to support the body’s efforts to combat prolonged stress. Adaptogens modulate the release of Cortisol, the “aging” hormone and help to uplift the body while simultaneously leveling it out. I have stage 3 breast cancer and I’m using herbal, B17, and vitamin C Chelation, as well as diet to fight this disease. Will this particular herbal combination help my situation or make it worse? Thank you for your advise. Yes I’m using a whole food diet in addition to my herbs, B17, and Vitamin “C” Chelation lots of out of doors garden work. My mother also was recently diagnosed with breast cancer and I haven’t heard that b17 could help her situation. What about these vitamins helps fight the cancer? I’ll need to talk to her about it and see if that would be a good option for her. Hi Kuzee, saw your post. I’m happy to hear you r doing ulternative type treatments . Food and nature’s gifts will give you back, not only longevity but control over your own health . In 2015 I got diagnosed with metastatic Breast cancer , had a large tumour on my pelvic bone. 1 year later it was gone! Just went for another check up, they can’t find it! I owe my success to a raw vegan diet, deep psychological work, supplements and herbs, self love, connection with my ancestral land, and above all the belief that We all hold the power of healing in outs hearts and in our mind . My advise for herbs and supplements is always seek professional help. Surround yourself with expert therapists , show up to your appointment educated , ask a lot of questions, leave with what your gutt thinks is right for you…. then take it on as the perfect remedy! It will work! It works! Thank you for your replay. I’ve seen The Truth about Cancer that’s why I know about B17. The Alternative doctors in my area are not too willing to help me only one will do the Chelation for me. I’m using various herbs to fight cancer along with a vegan diet lots of juicing and out of doors gardening. Kuzee you sound like you are doing many of the right things. You should look into detoxing the liver, gall bladder, kidneys, lymph to make sure they are cleaned out. I do detoxing in some form daily. Make sure you are never constipated if so look into Vit C Flush, Salt Flush, Magnesium flush to replenish these in your body. In addition to the chelation you could be taking high doses of Lyposomal Vit C or get Vit C Infusions. Have any fillings removed and non metal, non allergic onces put in. Have all root canals looked into by a biological dentist. Most breast cancers are on the same side as a root canal. I hope these things help.. Look at Cancertutor.com for more info. Aww bless you! be sure to check out the truth about cancer on YouTube! I have breast cancer and am using raw food diet, B17, St. Mary’s thistle coffee enemas but am currently doing black salve and it’s working a treat. Has been sore…but it works. Very good report. I include the sacred herb ayurbeda Gotu Kola, to balance the mind. Which is a supreme adaptogen linked to mental improvement. It helps to create a balance in the nervous system and brain functioning, thereby decreasing the symptoms of anxiety and depression. Thank you very much, these are really what we need. Now how to use them ? How much to use, in water, cold or boiling, with anything? Please help, early want to use them. Please tell me which of these are safe for auto-immune disease. I am so frustrated! I have chronic stress yet virtually every adaptogenic herb seems contra-indicated for auto-immune conditions e.g. ashwaganda is a nightshade, ginseng and medicinal mushrooms are immune stimulators etc. Please help…! Astragalus helps both stress and autoimmunity. I used to suffer from chronic anxiety and debilitating panick attacks. Nothing would calm me down. I did a parasite cleanse. I no longer have panic attacks and I am calm and serene. Good luck on your journey. I really appreciate this article for underscoring the need for regular use of adaptogens. Fabulous article . Very detailed and appreciate it very much!!! Does organixx have a product with a combination of all it most of these herbs? Thank you for this particular compilation. All on one page to find what is more important to each individual. I have taken several of these at different times in my life and believe in their work. Also, people’s needs change throughout life, needing change in help. Great source of information. Thank you!!! It would be helpful to know where these herbs are available. I live in Australia, Perth. Where can we get those herbs to help with stress? Any supllier in Western Australia? Taking these herbs on their own may help, but they usually work better in properly prepared formulas. For that you should consult an Ayurvedic or TCM (Chinese Medicine) practitioner. Ty. Thanks for giving me this list. And thank you for all the work you are doing. I followed your anti cancer videos, with great interest. I use ashwagandha currently because my thyroid medication is unbalanced – though it will be sorted soon. And I always welcome a good cup of Tulsi tea. I have been suspicious of Maca because, like Siberian Ginseng it is thought to be bad for people with high blood pressure…. Thank you, Ty. This is much appreciated, at a time when I ame trying to return to a normal life after breaking my back – at 77. JTH3, You may want to look into the healing properties of Mullein for your back. Best regards. Very interesting, three of them were new to me. Where is the best place to get these herbs? What is a good place to obtain these stress relief herbs? Thank You for this site also not trying to sell products. Thank you. These are not easy to get apart from licoricevwhich played havoc with my bp years ago. Quite stressful to read about the herbs and have no idea where to get them especially in rural areas. I teach stress management and will pass on in case they can source them…Yao are a mine of info Ty. I have suffered from Adrenal Fatigue for 4-5 years before self diagnosing. I started on Ashwaghanda & noticed an immediate improvement in my sleep patterns & anxiety symptoms. I also consumed a good quality Esterfied Vit C.
I came off prescribed tranquilizers & today, 2 years later I am 99% better. Where did you get it from? How did you know how much to take? Excellent article. I struggle with a bi-polar mood disorder which includes high levels of anxiety and panic disorder as well as depression. This causes a lot of stress to say the least. Because I take an array of medications I am concerened how natural medicines will work with western medicine so I am hesitant to mix them although I have drank finding tea without any difficulty. Is there a resource for functional medical physicians in my area and do they study about this?I live near Raleigh, NC. Thank you. What is the best way to use these adaptogens? Buying them in capsule form and taking them as a supplement? Or buying them in powder form and adding them to food…? Either way. I add maca powder to my smoothies. Some can be used as tea for light doses such as the ginseng. Most are capsule based to get the required specific dosage correct. Capsule is also an easy way to manage your dose yourself. Tried to order 3 bottles, but it would not change from 1, so I clicked out. Will try again tomorrow. Thanks Ty for these pearls of very important Information. You are doing God’s work. Love Light and Life Eternal. We are glad you are enjoying learning this information John! I’m a little confused. I purchased Meta-plexx, the product I was referred to after reading about the 10 adaptogens for combating stress and regulating cortisol as described above. But when I read the ingredients for Meta-plexx, it does not list these adaptogens as part of them. Can you help clarify? Thanks. Always good to further your knowledge on matters of health, whether spiritually. mentally or physically. The whole person needs all these to function correctly. Why not answer all the other questions. Do you only answer the people who are having trouble to buy your product. Why is ganoderma lucidum not on this list? Thanks for letting us know about this Lloyd! I will suggest this as something we research about in the future. rasberries…strawberries are good to eat……wheat grass…germinated sprouts …yes, diet does help. A relation used to take all the above and it did help. Thank you very much for this. I have been looking for some good articles about how stress effects people, as well as information regarding ways to treat stress and anxiety. This one is far and away better then any I have come across so far. I need it to use in court, so need one that has good references including studies , however also need it to be in language easy for the uninformed to understand and appreciate.. If you are looking for more information about this topic you can look through the sources tab on this article. It is directly above the article summary.